Description: Great location just south of town with shared access on cedar hedge lake. 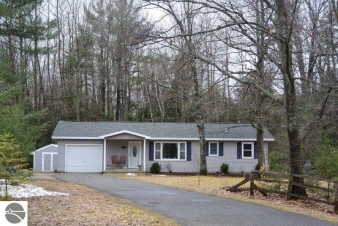 Neat, clean, squared away ranch style home. Inviting covered front porch with stamped concrete apron. Open kitchen/dining room. Ceramic tile backsplash in kitchen. Hardwood floors in kitchen, dining room, 1 bedroom. Ceiling fans in living room, master. Finished lower level with family room and den. All new windows except lower level. Newly built 12 x 12 shed. Massive back deck, stamped concrete patio, yard is fenced with gates. Pine trees on both sides and a deep lot that goes back into a heavily wooded area ensure some privacy.